Emergency doctors staff emergency rooms. We see whatever comes in, as fast as it comes in. We are the front door of the hospital, and we never close our doors. The specialty is defined by several key characteristics, which are virtues or vices, depending on your perspective, and often they are both at the same time. So I’m going to present them as both at the same time, in a sort of pro-con format. No other doctor routinely manages patients she knows nothing about. A typical emergency patient was found on the street in a coma. He could be minutes away from dying, or just really drunk and needs to sleep it off. We’ve got to figure it out without even knowing his name, much less his medical history or the events leading up to his present condition. Making the diagnosis is really fun. However, Uncertainty is the currency of emergency medicine. We have to make important decisions with very little information. We are wrong a lot. Sometimes, when we’re wrong, people die. Learning to be comfortable with uncertainty is difficult. Emergency physicians have to think fast and act fast. It has been reported that emergency medicine has the highest decision density not just of any medical specialty but of any human endeavor. This is fantastic for people who have limited attention spans and require a lot of stimulation. It also makes shifts fly by; I routinely realize it’s time to start wrapping up and I feel like I just arrived. However, when you work in the emergency room, you are working hard. It’s tiring. Emergency physicians do not follow patients. When you’re off, you’re off. We do not carry pagers. Being off when you’re off is a big deal from a quality of life perspective – when your shift ends at six, and you make plans for eight, you’re going to be there, and you’re not going to get called away. However, we don’t form relationships with patients, and the patients we do form relationships with are usually not the kind of patients you want to form relationships with. Emergency medicine can feel impersonal, and it’s harder to learn from your mistakes because the consequences of your mistakes often are not apparent until you’re no longer taking care of the patient. But mostly the problem is that we don’t get chocolates from our patients at holiday time. Scheduling for emergency docs is flexible – if I want a month off, I can just ask not to be put on the schedule for a month. Combine this flexibility with the momentary care aspect–that we don’t follow patients–and you can see how this makes for a kind of freedom that is pretty unique in medicine. However, emergency clinicians work erratic hours, including nights. 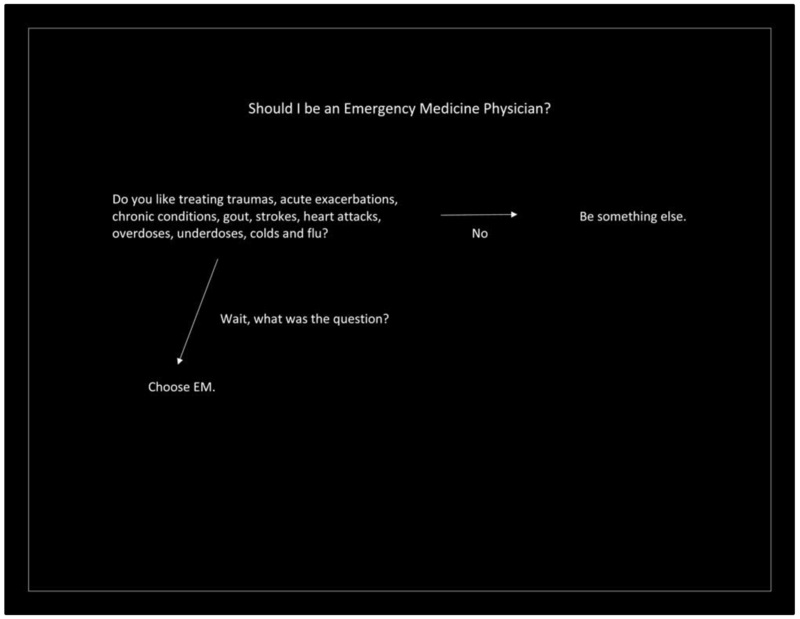 This is probably the biggest challenge for emerg docs. If you need a regular schedule to sleep right, this is not the speciality for you. The ED never closes, and so we work evenings, nights, weekends, and holidays. We take a lot of pride of being available whenever we are needed, but sometimes you can feel out of sync with the rest of the world. We are the safety net for everyone and, health care reform aside, that’s not going to change anytime soon. The emergency department is on the ground floor, and when you work in the emergency department, you feel like you are connected to the community. You feel like you are helping people who really need help. However, our workflow is dictated by whatever comes through the front doors, and this is entirely unpredictable. The emergency department is in a constant state of barely controlled chaos, and sometimes it’s uncontrolled chaos. Many of my patients are having the worst day of their lives. Many of my patients live on the margins of society and their average day is worse than the worst day of most people’s lives. It can be very challenging to take care of these patients. You name it, we deal with it. No other specialty even comes close to the multiplicity of presentations and diagnoses that an emergency physician confronts in a single shift. You get to put your hand in a lot of cookie jars. However, emergency physicians rely heavily on consultants. I spend a lot of time on the phone talking to people whom I’m giving work to, so they don’t really want to talk to me. Also, when I call a consultant, I’m talking to someone who knows more about what we’re talking about than I do. When I have a complex neurology problem, I call a neurologist and talk with her about neurology; when I have a complex dermatology problem, I call a dermatologist and speak with her about dermatology. And sometimes consultants can get really uppity and even condescending, especially the ones who never come down to the emergency department and see us reducing fractures, and defibrillating people in cardiac arrest, and delivering babies, and sewing up the laceration on the billionaire everyone’s heard of who’s lying one gurney over from the undocumented immigrant who also has a laceration and speaks a language no one’s heard of, and providing comfort care to the 96 year old taking her last few breaths, and intubating the nearly dead 10 day old with undiagnosed congenital heart disease. But constantly asking for help can be hard on the ego. You have to be comfortable not being the expert.